Trauma can be caused by a one off significant event such as a car accident, loss of a family member, divorce, loss of employment, or be known as complex trauma such as P.T.S.D (Posttraumatic stress disorder)( abuse, neglect, chronic illness, bullied at school, anxiety depression and constant stress. Trauma impacts negatively on your brain, your cognitive reasoning (your logical thinking) and your nervous system. It can affect your breathing, blood pressure, heart rate, muscles, how you react to events and situations. It may prevent the availability of your logical brain (higher thinking capacity such as making decisions). It can also occur when your body is unable to reset itself to it's natural homeostasis. Professor Sandy Mcfarlane states - being Traumatised is like living in a room with the lights turned out. Behavioural issues or body symptoms (which can be under your subconscious) are not always the real story. Learning about what has happened in your past, what has been contributing to your current functioning, can be life changing. Your body can hold trauma even if your mind has blocked out the event/s. This is why it is important to work with both your mind and body together as they are connected. Trauma can affect your child's sequential development of their brain, which may impact on such things as their motor skills, language or social skills, this depends on what age your child occurred the trauma. Trauma decreases their attention capacity. Connecting with the horses and using appropriate aged based activities can help to re-wire your child's neural pathways towards positive outcomes. Horses can help your child to engage in experiences that redirect their attention away from past traumas and triggers to the here and now. Neurobiology has shown that repetition, healthy relationships and integrating their story is very important to your child's healing and wellbeing. Your child can tell their story through their body's reactions, especially when your child may not have strong language skills. Horses can encourage your child to have fun which leads to profound positive experiences. 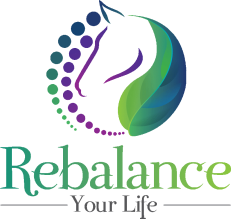 Horses can help promote trust and belonging within your child with the assistants of especially designed activities at Rebalance Your Life. The horses co-facilitate with me by showing up patterns and behaviours in you, offering an opportunity for us to be curious about these patterns/behaviours - taking an explicit look in a supported environment. Horses are not judgmental, there is no right or wrong way. Equine therapy is a gentle way of moving through what may at times bring up painful memories, it can be very empowering when working with these majestic animals. Often being described as an extraordinary or profound moment when first connecting with the horse.